Get Inspired. Network and Grow Success. Why businesses of all sizes choose Salesforce? or anything else — our highly trained reps are standing by, ready to help. Grow your sales pipeline, improve customer service, and make data-backed marketing decisions. 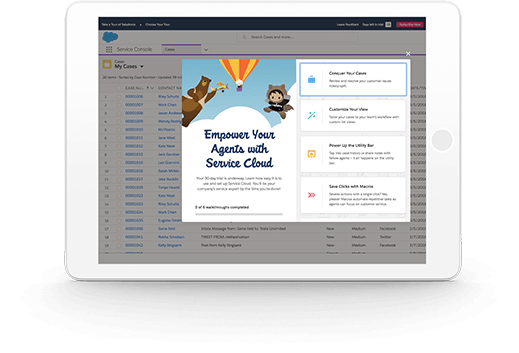 Salesforce CRM tools are cloud-based and mobile friendly so you can access your data from anywhere! Our CRM software is fast, secure and doesn’t require maintenance. Explore the world’s best CRM solution. CRM solutions help ensure that your sales, marketing, and support efforts are all working toward a common goal, so you can take your business success to a whole new level. Streamline and automate business processes, give everyone in your company a complete view of the customer, provide deeper analysis and insight into critical sales and customer metrics, and keep everyone focused on getting new customers while keeping the ones you already have happy. CRM Solutions for Sales & Marketing. Generate more leads, effectively market through multiple channels, optimize lead management, convert leads into customers, view all account-related information and activities, keep sales reps working productively, analyze your sales pipeline, and see what’s working and what’s not. An effective CRM solution helps you keep sales and marketing focused on filling the sales pipeline and generating more revenue rather than manually tracking sales leads. CRM Solutions for Activity Management. View all customer transactions, respond confidently to customer calls or emails, capture important information about customer interactions, and manage your tasks and follow-up activities with CRM. CRM Solutions for Service & Support. Collect customer support requests from all your channels, assign support cases to the appropriate agent or group of agents, leverage the best solutions to customer problems, escalate support cases when needed, help customers find solutions via your Web site, stick to the service-level agreements you have with your customers, and identify areas for service improvements. All that translates to better service and happier customers. Cloud Computing Applications Over 80,000 cloud computing applications run on Force.com. Find out why. CRM Demo View Salesforce CRM product demos and learn how CRM can help your business succeed. What is SaaS Learn to harness the power of software as a service systems. CRM Training We offer professional learning paths for admins, developers, and consultants.